On 13 February, President Alyaksandr Lukashenka complained about Russia’s unwillingness to arm the Belarusian army. On 23 February, the ideological periodical of Belarusian government published an article by the defence minister, Andrei Raukou, who described how Belarus would defend itself without mentioning any Russian role in it. According to him, Belarusian army focuses on learning the lessons of hybrid war in Syria. But the concept itself is much more linked to the war in Eastern Ukraine and the minister most probably kept silence about it just to not irritate the Kremlin. Minsk, in recent years, has been rebuilding its army according to its own needs and opportunities while ignoring Moscow’s wishes. This conclusion follows from official statements and from the Belarusian army’s rearmament plans. As a result, the Belarusian armed forces increasingly resemble the army of a small European nation. Speaking on 22 February at a ceremony marking Defenders of the Fatherland and Armed Forces Day, Lukashenka again repeated his criticism of increasing militarisation in Belarus’s neighbourhood and throughout the world. His statements on Belarusian preparations for defence and rearmament included some remarkable points. In the event of a military threat, we must be ready for the nationwide defence of Belarus. 70,000 men of our army cannot defend our state. … the land must be protected by the whole people. … In the event of a military conflict, we are able, within a short period of time, to arm half a million people and defend the most important facilities by the territorial defence forces. This is the essence of our defence doctrine. This statement follows related developments in Belarusian government’s views of defence issues. Ironically, they involve militarisation as well. In March 2017 the government demanded that border security agencies increase their military [voiskovoi] components. Meanwhile, on 7 December Belarusian parliament amended the Law on the Fight Against Terrorism, adding national armed forces to the list of agencies expected to fight against terrorism. Given the fact that neighbouring Ukraine designated a full-scale war in its eastern regions as an “anti–terrorist operation,” this probably means Minsk is taking further precautions against Donbas scenario. 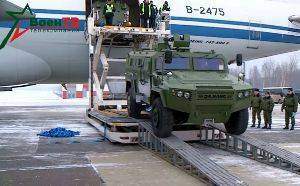 Chinese armoured vehicles arriving in Belarus. Image: VoenTV. Secondly, on 22 February Lukashenka emphasised the Belarusian army’s receipt of new arms to respond to new challenges. He praised… not Russia, but China for its help in this sphere. Indeed, on 18 February, Belarusian state media reported that the national army received the second batch of CS/VN3 Dajiang armoured vehicles from China. The first five vehicles arrived back in June 2017 and were even deployed in the “West-2017″ drills. Russia itself is modernising its armed forces. We are trying, together with other members [of the CSTO], to somehow arm, modernise ourselves and so on. Everyone on its own … But the leadership of Russia today lacks a serious understanding that it is necessary to strengthen the national armed forces … [of] Belarus, Kazakhstan, Armenia and other countries – that, say, Belarus is the main outpost, including for Russia, in the western direction. Minsk clearly expects more Russian help to develop and maintain the Belarusian army. Too often it suffers disappointment. In recent months, Belarusian officials – from the president to the to the defence minister and air force commander – either keep silent or sound remarkably uncertain about the most important arms deal between Minsk and Moscow of recent times, namely the purchase of new Su-30 fighter jets. Defence minister Andrei Raukou. Image: BelTA. For instance, at a news conference on 14 February, defence minister Andrei Raukou announced that the delivery of Su–30 aircraft to Belarus may not start until 2019. 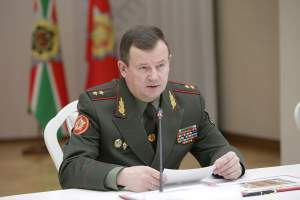 Even more remarkably he completely omitted the Su–30 deal in his major interview to BelTA news agency on 23 February in which he described at length the equipment Belarus plans to purchase for its army. About a year ago top Belarusian defence officials clearly insisted that the Belarusian army would receive twelve new Su–30s with delivery beginning in 2018. The official reason for the delay cites the Western embargo on the supply of some components for the aeroplanes to Russia, a result of Moscow’s meddling in eastern Ukraine. But it sounds odd given that Russia continues production of the same jets for other countries. Most probably, Minsk still needs to find a way to pay for the jets. After all, it earlier indicated its wish both to get maximum discount and to pay as much as possible with goods and not money. Historical context casts a different light on the story around rearming the Belarusian army with Russian weapons. To put it plainly, today Minsk strives to acquire from Russia a dozen of Su–30 aircraft – not even a regiment. Belarus fought for about a decade and yet, apparently, the problems persist. These are definitely not the “good old days” of Belarus-Russian partnership when, as recently as the early 2000s, Minsk and Moscow even negotiated over assembly production of essentially the same aircraft, the Su–27, in Belarus. No wonder that, faced with Moscow’s reluctance to arm its Belarusian allies, Minsk simply rearranges its armed forces to suit its own needs and thinks ever less about the wishes of the Kremlin. Describing the process of rearmament in an interview to the BelTA news agency on 23 February, the defence minister, Raukou, called it “selective” and “pointed” [tochechnaya]. In particular, according to Raukou, Minsk will soon modernise its T-72 tanks in both Belarusian and Russian factories, as well as deploy more Belarusian–manufactured armoured vehicles V1 and Kaiman, and Belarusian-modernised BTR-70MB1. Among its planned acquisitions for 2018, the armed forces will obtain additional Yak-130 training and light-attack aircraft, TOR-M2 surface-to-air missile systems, radars, and drones. That means the Belarusian army avoids any comprehensive rearming. It decommissions some equipment without like-for-like replacement if Belarus, as a small country, does not need it itself and Russia refuses to supply a replacement either. 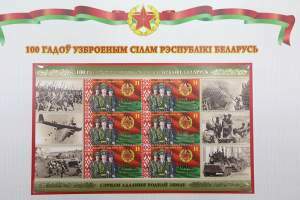 Postage stamps dedicated to the 100th anniversary of Belarusian army and its predecessor, the Red Army. President Lukashenka, speaking on occasion of the Defenders of the Fatherland and Armed Forces Day, praised new products of national industries being deployed by the state army. He specifically mentioned a new ballistic missile for the Palanez multiple-launch rocket system, a surface-to-air missile system and lightly armoured vehicles. And he altogether failed to mention the new aircraft to be bought from Russia. To sum up, on the one hand, Belarus fulfils its dues as Russia’s ally and participates in the air defence of the core Russian regions as much as it can. Hence so much attention to surface–to–air missiles, radars and similar equipment. On 31 January, Belarus’s state military-industrial committee reported that the export of Belarusian arms in 2017 exceeded the previous year by 15%, reaching more than $1bn sales. Growth occurred despite problems in accessing Russian military orders, an unclear situation about cooperation with Ukraine and the reported disruption of a deal with Azerbaijan. Meanwhile, Belarusian officials announced plans to produce new missiles and combat drones. Last year’s performance of the national defence industry proves that Belarus evolves economically. It also demonstrates the contradictory balance between Minsk’s efforts to maintain neutrality and its efforts to manoeuvre between Moscow and Kyiv, Baku and Yerevan, and other centres. On 31 January, a session of the managing officials of Belarus’s state military-industrial committee summarised the results of the committee’s work in 2017. According to official information, production grew by a quarter. Total exports of Belarusian arms exceeded the previous year’s level by 15% and made up more than $1bn in sales. While the government steadily struggles with problems in the civilian segments of its machine-building branch, the defence industries perform much better. 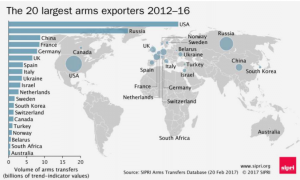 They continue to earn impressive sums year after year, such that Belarus retains its position among top-20 world arms sellers. Belarusian arms manufacturers have also diversified their client base. In 2017 they sold products to 69 countries, compared to just 60 countries in 2016. For instance, Minsk-based KB Radar could export its electronic warfare systems Groza-S and Optima-B, while the Barysau-based 140th Tank Repair Plant delivered its light-armoured vehicles, Kaiman and V-1, not only to the Belarusian army but also to an undisclosed African nation. On state TV, Belarusian businessmen and defence firm managers, including from Minotor-Servis and Integral, have openly criticised Russia’s policy that aims to substitute Belarusian components in its military equipment. Furthermore, the chairman of the state military industrial committee, Aleh Dvihalyou, admitted on 31 January that Belarusian firms still face restrictions on receiving Russian state defence orders. In any case, 46% of interactions involve non-Russian firms and, apparently, the committee did not calculate interaction with Ukraine here. After all, on 1 February, an unnamed representative of the committee talking to Nasha Niva weekly announced that military-technical cooperation with Ukraine had been halted as early as in 2014. Minsk allegedly stopped selling Kyiv military equipment immediately after it started military operations in eastern Ukraine. This statement likely shows the wish to downplay respective contacts with Ukraine which undoubtedly continue, although Minsk most probably reclassified them in order not to irritate Russian chauvinists. Did Armenia disrupt Minsk-Baku deals? In addition to difficulties with Russia and Ukraine, Belarus recently needed to resolve controversies in its collaboration with Azerbaijan. On 1 February, Belarusian journalist Alyaksandr Alesin told the daily Komsomolskaya pravda v Belorussii that Minsk had renounced the deal it negotiated with Baku for the sale of Palanez multiple launch rocket systems (MLRS). He insisted that the Belarusian government renounced these plans because of Armenia’s intervention. Armenia, clashing with Azerbaijan over Karabagh, formally partners Minsk in the Collective Security Treaty Organisation. Alesin announced that Minsk would soon sell arms to Armenia instead. The Russian propaganda outlet Eurasia Daily followed the story on 6 February. It quoted Russian and Armenian military experts as saying that there was probably never such a deal in the first place. These allegations clash with some well-known realities. First, Yerevan has hardly any leverage over Minsk. For more than a decade, Baku and Minsk have cooperated in effectively every sphere and the Belarusian government has no interest in disrupting such relations because of Armenia. Yerevan, by far the poorer of the Caucasus states, cannot replace Baku, especially in the defence sphere. Much circumstantial evidence indicates that Minsk and Baku at least considered the Palanez deal. First, top defence and defence industry officials from both countries held numerous talks in recent years. 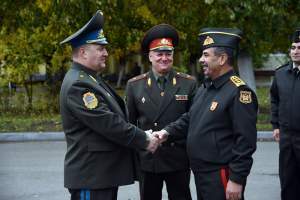 Official announcements acknowledged that last year’s negotiations between the Belarusian and Azerbaijani presidents covered defence cooperation. Almost certainly these negotiations included Palanez – it cannot be otherwise, given the importance Lukashenka attaches to his Palanez project. Azerbaijan also has an interest in such weapons to neutralise the Iskander ballistic missiles Armenia received last year. Last but not least, a prominent Azerbaijani expert, general Yaşar Aydəmirov, spoke to several Azerbaijani media about the probability of such a deal between Belarus and Azerbaijan. Minsk tries to develop new products to counter problems in traditional markets. Talking to the BelTA news agency on 31 January, the state secretary of security council, Stanislau Zas’, revealed plans to produce new sophisticated arms. In particular, this year, defence industries are planning to complete the development of combat drones. 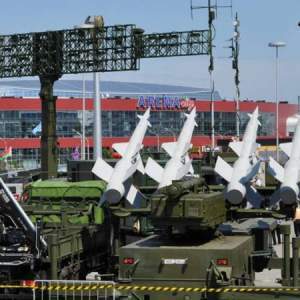 Above all, however, Minsk develops its defence industrial capacities in the area of rockets and missiles. Minsk started its missile programme from zero, perhaps only in the early 2010s. In the quoted interview, Zas’ said that in the first half of 2018 Belarus would test a new, completely Belarusian-made rocket for the Palanez MLRS. Until now, Belarusians relied on rockets including some Chinese parts for this system. In addition to replacing the remaining foreign components in the Palanez rockets, Zas’ announced that designers were developing a new, Belarusian missile for the Soviet-designed Buk surface-to-air missile (SAM) system. Minsk believes that with the introduction of a new missile it can make the SAM system fit-for-purpose again. According to circumstantial evidence published in Belarusian media, it could be retro-fitted Soviet-designed air-to-air missile types R-60 and R-73 that Belarusian designers intend to use in a new version of the Buk SAM system. First, Belarusian company Belspetsvneshtechnika has modernised these missiles to extend their lifetime and efficiency. Moreoever, it has designed new modifications, R-60BM and R-73BM, to be launched also from land-based SAM systems. To summarise, the Belarusian defence industry faces multiple challenges which, if not addressed, could weaken the industry in the long term. First, instability in cooperation with Russia and Ukraine, especially with both at the same time, looks potentially damaging. Secondly, the national arms manufacturers need to design new defence products, sometimes never before produced in Belarus, as older Soviet types become outdated. However, if the national defence industry copes with both tasks by diversifying its partnerships and developing new products, that not only will ensure its survival but also strengthen the country’s independence.